Premiered officially today on Zane Lowe BBC Radio 1, the Swedish maestro has finally unveiled his take on “Tether” in full. Teeming with signature Prydz touches, the original melodies of “Tether” glide atop sparkling progressions and sweeping bursts of gusto. 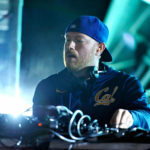 Without a doubt, his newest adaptation eclipses the already high-set mark of his previous efforts, readily set as a hotly anticipated gem of the Prydz collection.